Quality indicators: main content:≥99.9%; moisture:≤0.03%. 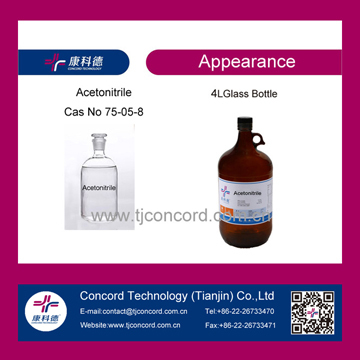 1.Acetonitrile is a colorless liquid. It is completely miscible with water and alcohol. Its high dipole moment makes it an excellent solvent for many organic compounds as wellas some inorganic compounds. 2.Acetonitrile is chemically stable and is a strong solvent. It is mainly used for the synthesis of organic compounds, and is suitable for electrical-chemical reaction and nonaqueous titration. Acetonitrile easily solvates with cations and enhances the reactivity of anions. 3.As with other nitrile compounds, the reactivity of acetonitrile's cyano group enables the production of many nitrogen-containing organic intermediates.